Almond milk, healthy dairy free alternative for breakfast! Breakfast time will become a lot more deliciously healthy with this super easy homemade Almond Milk recipe! Forget about store-bought dairy free / vegan milk alternatives. 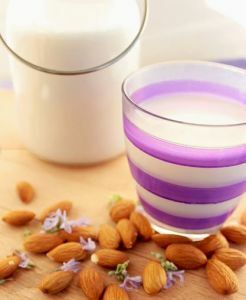 Follow this fool-proof recipe to make your own delicious Almond Milk, sweet, mild, and more gentle on the digestive system than heavily processed milks. It is fantastic to drink, put it on cereals, use in smoothies and shakes, and in cakes. Almond milk will turn your favorite dishes into dairy free ones, without sacrificing the flavour! 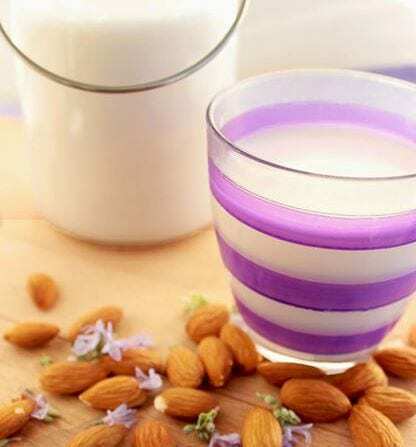 Whether you’re a vegan, sensitive to milk or just don’t like the taste, almond milk is a fantastic alternative. It’s rich in vitamin E, which contains antioxidant properties essential to your skin’s health. Almond milk is also a perfect substitute if you want to maintain a healthy diet or lose weight. One cup contains only 60 calories, as opposed to 146 calories in whole milk, 122 calories in 2 percent, 102 calories in 1 percent, and 86 calories in skimmed. Use almond milk to make your favorite breakfast smoothie, or try this delicious Antioxidant Red Berries Smoothie! Soak almonds for at least 12 hours in purified water. Rinse almonds well and drain. Mix almonds with half the fresh water in a blender, until smooth and creamy. Add honey/maple syrup and the remaining water. Blend until smooth. Strain the mixture into a large bowl through a cheese cloth or kitchen towel. Use a spoon or spatula to press down on the strainer and move the solids around, to help the almond milk through the cheesecloth. Gently squeeze the cheesecloth to remove excess liquid. You’ll be left with really fine almond flour inside the cheesecloth. You can dry it out in the oven at a low temperature and use it in place of store-bought almond flour in baking recipes. Store your almond milk in the fridge for up to 4 days and enjoy!